I thought long and hard about the vegetarian main course for the Christmas meal. The best option that I've found is this millet salad made with a lot of different flavours and textures. The salad take a while to make but it's completely gorgeous and festive. 24 hours before, take a bunch of rainbow swiss chard. Cut off the stems and set the leaves aside for later. Wash the stems and pat them dry, then cut them into 2-3 inch long pieces. Mix 1/2 cup water with 1/4 cup white vinegar. Add 1/2 tbsp. salt and stir until the salt dissolves. Pack the swiss chard stems into a glass jar, pour over the liquid to cover and pop into the fridge to pickle. 12 hours before, soak 1/2 cup millet in plenty of water. You can also use other grains like quinoa or barley - they may not need soaking so follow the package directions on how to cook them. To put together the salad, boil a saucepan of water. Add the soaked millet, bring to a boil and let cook on a simmer until the grains are soft. This can take upto an hour so you can speed up the process by using a pressure cooker. Next, chop up your reserved swiss chard leaves into thin strips. Also, finely chop a small red onion. Heat 1/2 tbsp olive oil in a pan and saute the onion and the swiss chard leaves until the onion starts to brown. Add the cooked millet, salt and pepper. Turn off the heat and mix in 1-2 tbsp of balsamic vinegar (or juice of lemon if you don't like balsamic). Finally mix in all the other things that make this salad special. 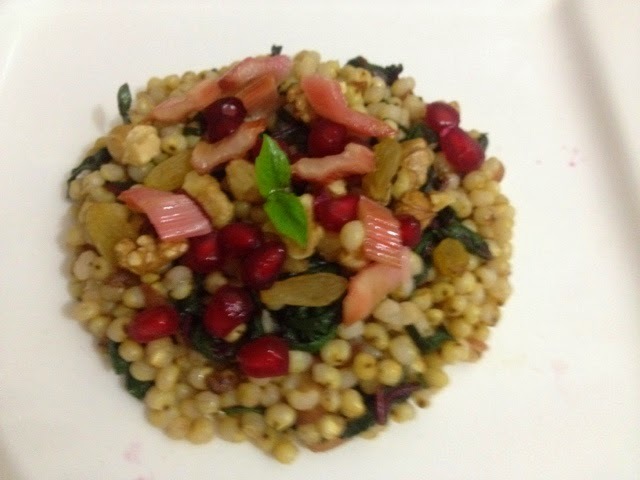 I added the pickled chard stems chopped into small pieces, walnuts, raisins and pomegranate seeds. If you don't like any of these, whatever combination of dried fruits, nuts and seeds you prefer.